Since the clientlaunch.exe gets its start parameter by default from the value “DefaultCommandLine”, another call of the clientlaunch.exe makes no sense, since it was already started with the default parameters. However, this key will not be created automatically by the IDERI note installation. So it must be created manually by us, but it will not be automatically deleted when uninstalling the IDERI note client. For this purpose the key “SecondaryClients” must first be created, as already mentioned above. Since we can not only start two but also three or even more client instances on one PC, we distribute the alternative instances to additional subkeys. That’s why we create another key below “SecondaryClients”. The given name doesn’t matter for the moment. I called it “InoteServer2” in my case. TCP (REG_DWORD) – This is where I define if I want to use TCP instead of NamedPipes. A value other than 0 indicates that TCP should be used. Port (REG_DWORD) – Here I define the TCP port to be used when using TCP. In this value we enter the name of the subkey we created earlier. In my case, that is “InoteServer2”. If everything is configured correctly, we can restart the IDERI note client and it will now display the IDERI note messages from both defined servers. 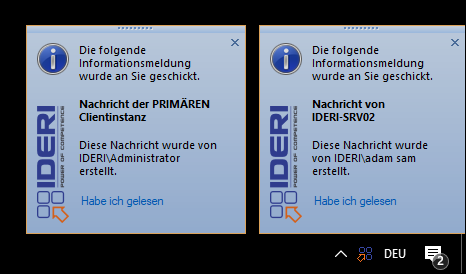 The message history of the user on the client can be displayed via the IDERI note tray icon. By default, however, only the history of the primary instance is displayed. But of course we can also show the histories of the secondary instances in the context menu. and name it “ClientHistoryMenuOrder“. As content I set the name of the subkek which contains my additional connection settings. and give it the name “HistoryMenuItem“. If I don’t set any content for this value, I still see in the context menu of the tray that I have already been offered two choices. In order to be able to differentiate the both histories better I should add content to the newly created value, as e.g. the server name so that this text will be displayed behind the context menu entry. This entry was posted in IDERI blog en, IDERI note en and tagged clientlaunch.exe, multi, multiple, multiple instances, multiple server, server connections by Sebastian Mann. Bookmark the permalink.